After many years of interest in amateur radio but never quite putting in the time to get a license--I finally did. I passed my technician test on January 3rd, 2016 and am offically a "ham"! After almost 2 weeks of waiting, I was assigned my call sign "KM4QID" on 01/19/16. I like it. Why now? Because I was given a Baofeng UV-5R5 handheld transceiver by my father-in-law this past Christmas. I had put it on my Amazon wishlist a while back, hoping to buy it when I got my license. It was a big surprise to receive it for Christmas! That was just what I needed to buckle down and pass the test. I'll admit having some experience homebrewing electronics as a kid probably gave me an easier time than some on the test, but there was still a vast amount of information I wasn't familiar with. There were two resources I used exclusively to pass the test. 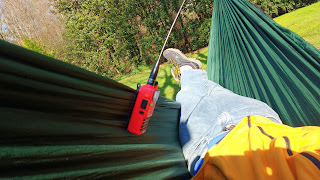 The best was HamExam.org Amateur Radio Practice Exams. If I wasn't in front of a computer and wanted to get some studying in, I really liked the Android app Ham Test Prep. Best part is that both are free. The Baofeng UV-5R5 has been pretty good. I've been able to hit local repeaters, sound quality reportedly is fine, and battery life is excellent. I added a Nagoya NA-771 antenna (pictured), which helps greatly with reception. As you can see, I like taking advantage of the portable aspect of the HT. I have a feeling that's going to be my favorite part of the hobby. I'm pretty excited to be a ham. Shortwave listening was fun, but I'm stoked to be able to make contacts.